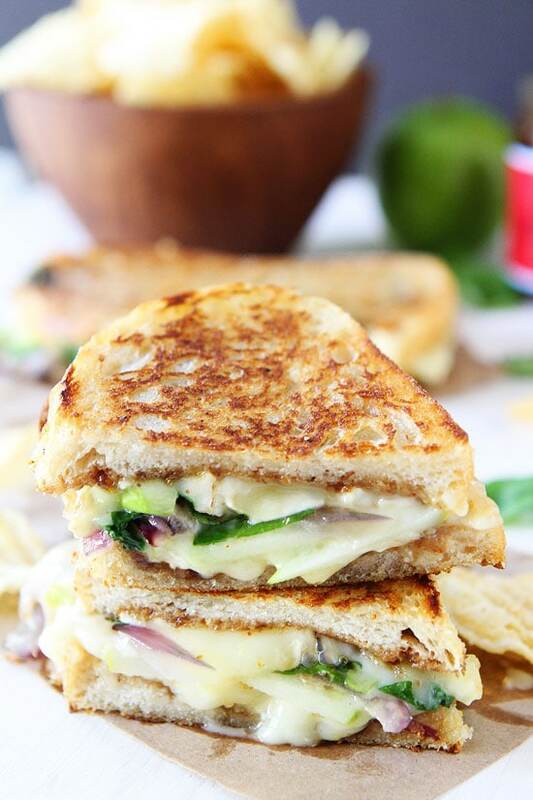 Brie, Fig, and Apple Grilled Cheese-this is the perfect grilled cheese sandwich for fall! Enjoy with a bowl of warm soup! I have been on a grilled cheese kick. I think it has something to do with the cold temperatures. Or maybe because grilled cheese sandwiches are so easy to make and I have been feeling lazy when dinner time rolls around. Or maybe because grilled cheese sandwiches are just SO GOOD! Whatever the reason, I am so in love with my latest sandwich creation, Brie, Fig, and Apple Grilled Cheese. It is the perfect fall sandwich! The melty brie with the tart, crunchy apple slices and sweet fig jam is the perfect package. 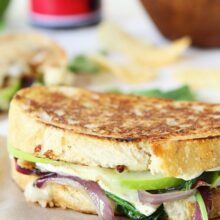 Oh, and there is caramelized onions and arugula too on buttery sourdough bread! Why not go all out? This grilled cheese is exploding with flavor! 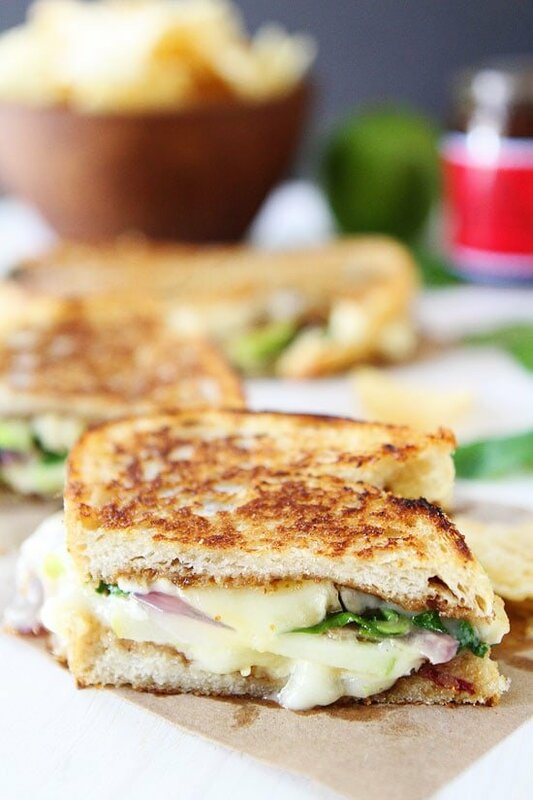 Grilled cheese equals classic comfort food and this Brie, Fig, and Apple Grilled Cheese is comfort food at it’s finest! This sandwich is SO gourmet, but SO easy to make! Don’t you love it when that happens! You don’t even have to leave your house to enjoy this gourmet sandwich…which is a big time bonus since it is cold outside. I hibernate in the winter and I am going to hibernate with this sandwich! This gourmet grilled cheese is so easy to make at home! 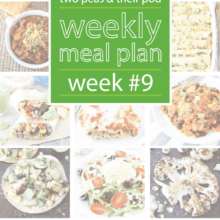 Serve with a bowl of soup or a simple salad! Heat the olive oil in a small skillet. Add the onion slices and cook until caramelized, stirring occasionally, about 5 minutes. Set aside. Butter the outside of each slice of bread. Spread fig butter or jam on the inside of each slice of bread. 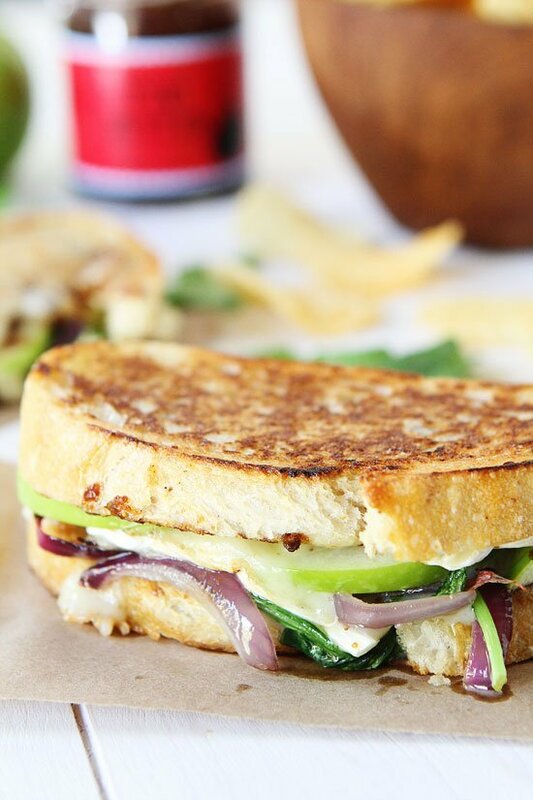 Layer the brie, apple slices, caramelized onions, and arugula. Top with the other slice of bread. Heat a large nonstick skillet or griddle pan over medium-high heat. Place the sandwiches, butter side down in the hot pan. Cook 2-3 minutes on each side or until browned and cheese melts. Cut sandwiches in half, if desired. Serve immediately. 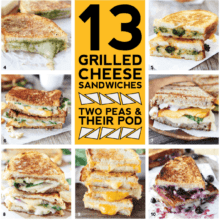 This grilled cheese looks SO beautiful and full of flavors–any grilled cheese that isn’t plain old American cheese on white sandwich bread is a good thing. I can’t wait to make this!! Apples+cheese is one of my favorite combos and this just looks unbelievable! Love these flavors for a grilled cheese, perfection!! This is pretty much a dream come true grilled cheese!! I’m like you – I can’t resist a good grilled cheese. Gooey CHeese has a way with my heart — Mmmm this sounds like my perfect, comfort meal … so delicious! So wonderful. Love the fig in there! Love this grilled cheese – the fig makes it. Love this combination – seriously all my favorite!! I love anything with figs. I could eat ten of these. This sandwich is speaking my language!!! Can’t believe I have everything to make this…(yay for ingredients leftover from Thanksgiving recipes!) I think it’s going to be lunch tomorrow! I don’t think this counts as a lazy dinner, because you are so right grilled cheese sandwiches rock. I love the resurgence of this with all the versions. Why this wasn’t done in the ‘old days’ , I have no idea. Wonderful combo of flavors. 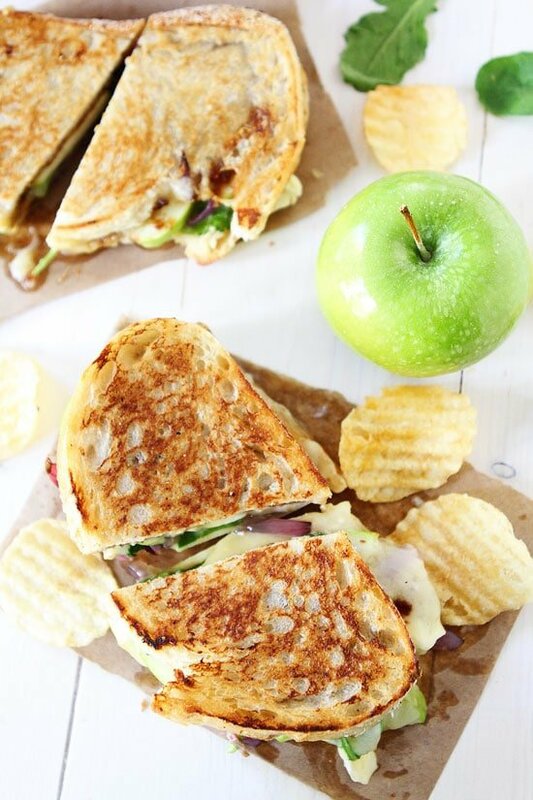 I love any kind of grilled cheese, but adding apple is one of my favorites! Never thought to add apple to a grilled cheese before, you definitely have got me curious to know what the combination tastes like! This is just what I need post Thanksgiving weekend on a rainy day, I think I will add a bit of turkey to mine as well! Is there another jam you could recommend other than the fig? This recipe sounds unbelievably good! We’ve been learning so much about cheese lately at http://www.spoiledtoperfection.com and how important the fermentation process is to flavor of cheese. Give me brie and sourdough or give me death! Anyone have recommendations for a soup pairing? Just finished eating 1.5 of these amazing sandwiches. They were so good! Such an amazing flavor combination. We didn’t have arugula on hand (because I didn’t read the ingredients list closely enough when making my shopping list) but subbed some green leaf lettuce and that worked well. Seriously so good! A keeper! Awesome Sandwich!! Made it in a panini press and served with soup. 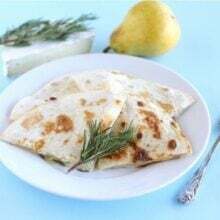 The sweetness of the jam and the peppery flavor of the arugula and richness of cheese is amazing! Cant wait to eat it again!